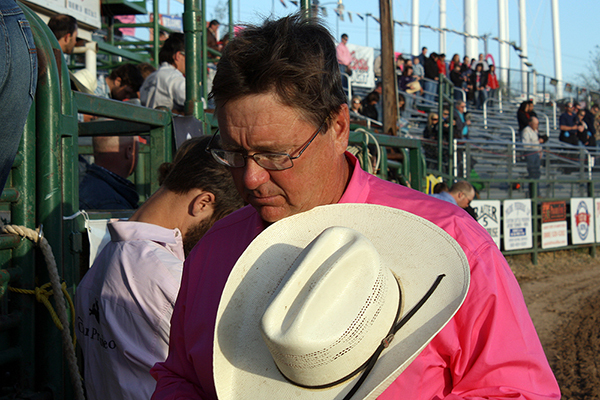 John Gwatney, Carr Pro Rodeo’s chute boss, wears pink during a recent rodeo performance. The Will Rogers Stampede will have it’s Tough Enough to Wear Pink night on Sunday, May 26. It’s one of many things on Sunday’s schedule. CLAREMORE, Okla. – A rodeo cowboy is the epitome of tough. It takes a great level of toughness to ride bucking horses or wrestle steers. It takes a great level of toughness to drive hundreds of miles in a single stretch to get from one event to another. But they have nothing on people battling cancer, and cowboys and cowgirls recognize that. That’s why most that make their living in rodeo support the Tough Enough to Wear Pink campaign, which helps raise money and awareness in the fight against cancer. It also is why organizers of the Will Rogers Stampede are including a pink night during this year’s rodeo, set for 7:45 p.m. Friday, May 24-Sunday, May 26, at the Will Rogers Round Up Club Arena in Claremore. It’s not the only disease the rodeo is hoping to battle. During the performance, volunteers also will be passing around pink boots to raise funds for the International Fibrodysplasia Ossificans Progressive Association. Zip Gordon is 5 years old, but he has been diagnosed with FOP; also known as stone man disease, the debilitating genetic disorder causes bone to form in muscle and connective tissue, potentially creating a second skeleton that severely restricts movement. The Gordons are conducting another fund-raiser in which they are drawing for a Jeep Wrangler, provided by Melton Motors. “All of the funds from the Jeep will go toward research,” she said, noting that there are three cases of FOP in Oklahoma, including another in Rogers County. “The funds from the event and the auction items will go to IFOPA, because as a family, IFOPA is important to us. They do a fantastic job in what they do. 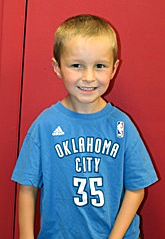 Of course, the Gordons have received great support from others in Claremore and Rogers County. “The community has been there so many ways,” Amy Gordon said. “So many people want to be part of the community, but they don’t know how. This is something they can be involved with. It’s a little boy, and everybody can relate to a little boy. More information can be found on a special website established for Zip, www.ZipperQ.com. They can also sign up for the Jeep drawing at the rodeo, and they need not be present to win. It’s just one way to celebrate a community that has reached out, but that’s what the rodeo is all about. It’s a great tie-in to the Will Rogers Memorial in Claremore, which is open 8 a.m.-5 p.m. every day of the year. “This is the 75th anniversary of the Will Rogers Memorial,” said Steve Gragert, the museum’s director. “This tribute at the rodeo is a way to recognize individuals that were key to the museum and key to Oklahoma. But that’s just a small sampling of a bountiful evening of fellowship, entertainment and competition. A cowboy church service will take place inside the arena at 6:30 p.m., and all fans that arrive prior to 7 p.m. will be admitted for free.